Sarıyer is the northern-most district on the European side of İstanbul, going right up to the Black Sea, an area blessed with coastlime and lush forest. Population 260,000. The Sarıyer district is a huge area comprised of the villages on the European shores of the Bosphorus from Rumelifeneri, down through Tarabya, Yeniköy, Istinye, Emirgan to Rumelihisarı, in other words most of the Bosphorus. 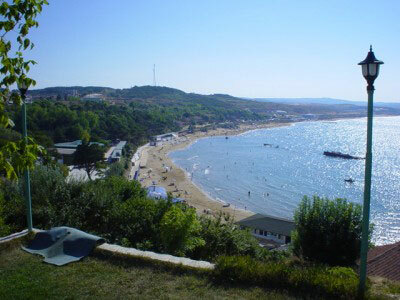 Sarıyer also administers the Black Sea coast to the west of the mouth of the Bosphorus including the village of Kilyos. Her neighbours are Eyüp the northwest, Beşiktaş the south and Şişli the west. With steep hills behind them the Bosphorus villages were all once rural fishing communities. Then this became a retreat for the city's wealthy. In the Ottoman period the Sultans would come for picnics and excursions. During the 18th and 19th centuries the coast was lined with summer residences of the wealthy foreign trading communities of Pera and Galata. Many foreign embassies built summer residences in this period. 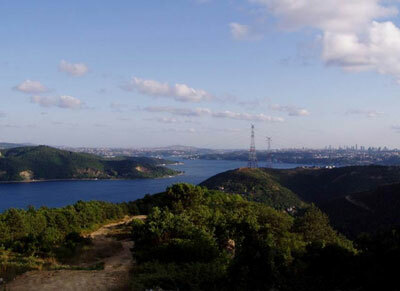 Now the coast road is in place and these villages, and increasingly the hillsides behind them, house many expensive villas owned by İstanbul's rich businessmen, actors and musicians, attracted by the coastline and the lush forest behind. Sariyer has recently been supplied with natural gas, and also a lot of new drainage has been put in. And they still haven't repaired the damage this did to the roads. The coast road up here is lined with fish restaurants of all kinds ranging from the most elegant to the, equally delicious, fish sandwiches served from boats moored by the sea wall. Unfortunately this coast is so popular with day-trippers and Sunday drivers that at weekends the pleasure of a driv along here is taken away by the crawling queues of traffic. The best way to come up here is by boat. As well as coast road Sarıyer can be accessed from the main road from Beşiktaş up to Maslak and beyond, this is the route used by the Sarıyer minibuses. There are also now high-speed ferry boats for commuting to the city, which is however quite some distance however you travel. Thus Sarıyer is not an over-crowded district. Emirgan - another former retreat from the city, with a rich green hillside behind. Now some villas have been built in the woods, but Emirgan is still green. Mamed for the Ottoman lords that would come here on excursions (Emir). There is a lovely square in the centre, shaded by huge plane tree, with a cafe in the middle. Home to the Sakıp Sabancı Museum. Reşitpaşa - crowded district on the hill above Emirgan, a big village, with some smart villas and lots of illegal gecekondu housing on a forested hillside. The Istanbul stock exchange is near here, in a 1960s concrete shed. Istinye - formerly a shipyard, still a small fishing port, with a village behind and tea gardens by the sea. Now being built up with luxury villas on the hillside. In 2003 the fortress-like American Consulate was built here. Has a smelly stream carrying raw sewage into the Bosphorus. Yeniköy - luxury villas on the hillside, a small area of tightly packed old houses near the sea, the old village, which with its churches and its long-establishes cafes and bakeries is an old-fahioned Istanbul cosmopolitan village, with a long-standing Greek community. Former prime-minister Tansu Çiller lives in a huge villa on the seafront. In recent years Yeniköy has acquired a community of Filipinos, working as domestic help in the big villas. The groceries sell foreign luxuries like cat food and Chinese sauces. Tarabya - (formerly Therapia- and indeed a sanctuary from the city for the sick) - a classy neighbourhood, dominated by the once-grand Tarabya Hotel. There are fish restaurants and 'taverna' to go and get emotional over a long evening of raki and melancholy traditional Turkish music. Marmara University has a small site here, teaching French, housed in a villa built by Alexander Ypsilantis. There was a stream here, now buried under concretee. Büyükdere - (the Byzantine Vathys Kolpos) a quiet residential area, a mixture of older streets of quiet houses and new estates of quality apartments. The luxury villas on the shore are home to some of Istanbul's most glittery. Home to a number of churches, the Spanish and Russian summer consulates and the Sadberk Hanim Museum. There are places to sit by the Bosphorus and take tea. Sarıyer itself - Still a traditional rural, working-class Turkish town, lacking in infrastructure, it is relaxed, friendly and has a high proportion of retired residents. You will see them taking long walks along the seafront. It has a small harbour where fishing is still practiced and therefore a fish market and a long line of famous fish restaurants. There are also a variety of cafés, kebab houses and bars, where many of İstanbul's city residents come to eat and drink at the weekends. Many of the restaurants are owned by famous musicians, who sometimes put on live shows for customers. For a daytime snack there is a well-known grilled chicken place called 'Özcan Baba'. The Belgrade forest, at one time the Ottoman military wouldcome on exercises. Today it is popular for picnics at the weekend, the road to Kilyos goes through here. Home to Istanbul University's department of forestry, hence accessible by public transport. There have always been rural communities here but since the 90's some luxury housing and private schools have been built in parts of the forest. The largest of these developments is the luxury new village of Zekeriyaköy, which although exposed to the cold, damp weather coming along the Black Sea coast is now one of the most expensive residential areas in Istanbul. The campus of the prestigious, private Koc University is here, which has been excellent for the taxi drivers of Sarıyer. Kilyos is a small town, a pleasant retreat from the city, although windswept in winter, (and even in summer the Black Sea can produce dramatic storms). Kilyos is one place Istanbul people can still swim in the sea, although the coast is rocky and strong currents sometimes make swimming in the Black Sea dangerous here. The road to Kilyos leads through the Belgrade Forest with its system of viaducts and reservoirs going back to the Ottoman period. There are lovely cool spots to stop in the forest or go for a country walk, and the hilltops have marvellous views of the Bosphorus and the Black Sea. For many years this whole area has been a popular spot for picnics. In recent years many homes have been built in the forest and Kilyos has acquired a number of bars and cafes, including a couple of well-known private beach clubs and a rock festival in summer. There are still beaches though and plenty of spots for a picnic, so on Sundays long queues of cars snake through the forest honking their horns at each other.